Today we are taking a look at the last and final two figures to complete the Mighty Morphin’ Power Rangers in the 6.5 inch Legacy line. This is wave 3, but technically the 4th wave due to the Toys R Us exclusive set of movie figures that came out a little while ago. This wave is again split between two teams. 2 figures are to complete the MMPR team, while the other three figures will complete the Power Rangers In Space team. 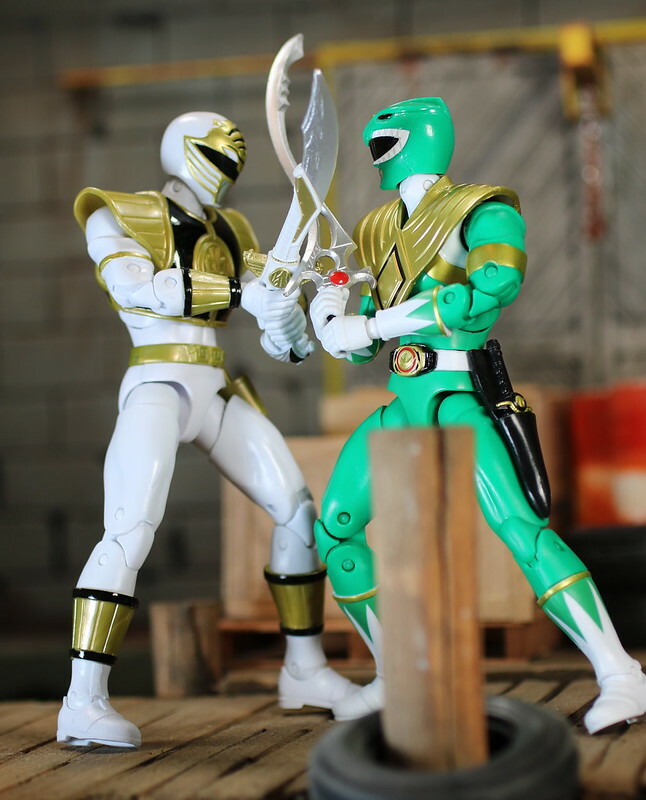 I grabbed the MMPR figures first since I know there is a whole lot of love for both the White and Yellow Rangers. It is not a big surprise that Bandai would wait until the end of the line to give us these two figures. First off, let’s look at the White Ranger. Another Tommy Oliver. Haha! This is not the first line to have multiple Tommy’s in it, and we have at least one more on the way, when we get to Zeo. Tommy comes with Saba, and a sheath for said beautiful sword. The Saba sword really is a work of art. Saba is so nicely painted, with a base of white, and touches of gold, red and silver. This is probably the most expensively colored single piece that Bandai has ever done in terms of paint apps. Facing off, Tommy vs Evil Tommy. Actually this works and is show accurate. If you remember, Rita had a second Tommy, an evil Tommy made, and they fought. Of course you know a copy is never quite as good as the original. Next up, let’s look at Trini. The original TigerRanger from Zyuranger was a male, hence the lack of a skirt. It made the transition to MMPR fairly well, and Trini had her helmet off enough that we just went along with it being her.Of course in the Legacy line, they give their ladies a little more going on up top, so this is definitely a woman this time around. She has one of my favorite helmets in the entire series, with the tiger face and teeth coming down over the visor. Trini comes with the final part of the Dino Megazord, though back in the day it was just Megazord. She comes with the yellow right leg. It is not quite as nice looking as the blue leg. It is a bit flat around the bottom, and the face of the tiger is a bit cartoonish. The girls are together and they look great. There are some subtle differences in the two, as to not just be a repainted copy from pink to yellow. For one, Trini is shorter than Kimberly. Now that I say that, in season 2, Trini leaves for a peace conference, and Aisha Campbell takes her place as the new Yellow Ranger along with Rocky and Adam who took over as the Red and Black Rangers respectively. The core 5 members look great together. The colors are so bright, as they were back in 1993. So many different colors that created a genre of action TV all it’s own. So, you can go with season 1 and 2, when Tommy broke the power of the Green Ranger and became a part of the team. Or you can go with Season 2 and 3 with the White Ranger. Whatever your favorite team makeup, you certainly can make it here. The Megazord is complete. As with other Build-a-Figure lines, these are generally very special parts that are going to end up being one-off parts. There are no other Zords that are like the Megazord, so we will only see these used once. Megazord is really well done. It has open hands that makes me think he should have a sword of some sort. It really is too bad it didn’t come with one. Now we have 2 complete Zords, not including the Astro Megazord that will be done with the rest of the In Space team at the end of this wave. I am really, really happy with what they are doing with these figures. Bandai America is really doing a great job of giving the Power Rangers fans what they really want and deserve. From fantastic figures, to nice Build-a-Figures. The rest of In Space will follow with Zeo on the horizon. There is also the whole metallic MMPR figures debacle that is coming soon, but I won’t get into that. I will just hope for a weapons pack so the core 5 can have their individual weapons at some point. This entry was posted on Tuesday, April 18th, 2017 at 5:52 pm	and tagged with action figures, Bandai, Billy Cranston, Black Ranger, Blue Ranger, Dino Megazord, figures, Green Ranger, Jason Lee Scott, Kimberly Ann Hart, Kyōryū Sentai Zyuranger, Megazord, Mighty Morphin Power Rangers, MMPR, MMPR Megazord, Ninja Storm, Ninja Storm Megazord, Pink Ranger, Red Ranger, Rocky DeSantos, Saban, Super Sentai, Tommy Oliver, Toy photography, toy review, Toys, Trini Kwan, White Ranger, Yellow Ranger, Zack Taylor and posted in Action Figures, Power Rangers, Toys, Vehicles. You can follow any responses to this entry through the RSS 2.0 feed.